EPL 2018/19: How Chelsea might line up this season. Antonio Conte has left the club after guiding them to a league title and a league cup in 2 years. What he could not do was to qualify the Blues for this season’s Champions League. The Blues did qualify for the Europa League and now they will hope to secure that title along with the Premier League and the League Cups. 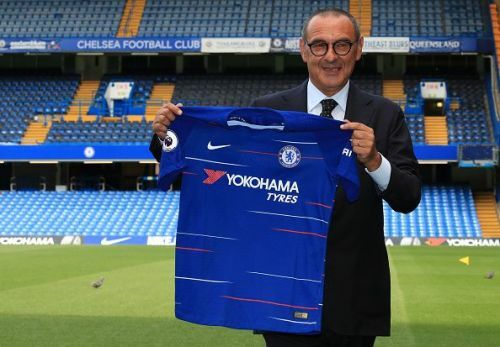 In order to accomplish these goals, the Blues brought in Mauro Sarri this season, from Napoli and replaced Antonio Conte as in-charge of Chelsea. With Sarri on board, the Chelsea fans will surely see a change in the formation and the 3 at the back preferred by Conte will not feature anymore. Having gone through the preseason with most of his star players off duty, Sarri will look to train the players returning from vacation as soon as possible and make them acquainted with his style. Sarri will bring his preferred 4-3-3 with him to compliment his free-flowing attacking game and we will look into the probable starting XI accordingly.